One of the best descriptions of the drinks writing game I have seen could be found on the business card of self-proclaimed “mono-award winning drinks writer and lifestyle commentator”, Ben Canaider. It said simply, “Typist who drinks”. Extraordinary knowledge, shaggy hair and a beard are optional. A passion for beer and a flair for communication are a must. It’s funny, deliberately self-deprecating and disarming, but of course there is much more to successful beer writing than having a keyboard and a drinking problem. 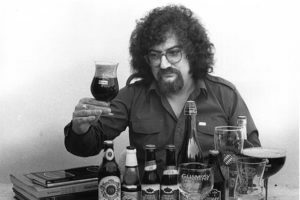 With the exception of a handful of practitioners, lead by doyen of Australian beer writers Willie Simpson, serious beer writing is a fairly new calling in Australian journalism. yet it is of fundamental importance to the growth of craft beer. Good writers don’t just describe what they are drinking, they engage the reader and enthuse their audience for it. They interpret and explain and inform and encourage. They make their passion and interest plain and ignite the same in others. They create discussion and disagreement as much as they generate nods of agreement. As the craft beer wave builds, we need more communicators to inform and educate. It’s great to see the Australian International Beer Awards, in partnership with beer champion James Smith of The Crafty Pint, have added a beer media award to this year’s program. It’s a great initiative, that will hopefully encourage more media to give serious coverage to beer and to inspire the existing pool of writers to strive to improve. If you have penned a line or two about beer this year, in a blog, newsletter, paper or magazine, or if you’re done something on film or radio…or even if you have shared your love for beer through interpretative dance, check out the awards information here and throw your hat into the ring. Or get writing, and have a go next year, and you too could have the claim to fame as a mono-award winning drinks writer. The entry form with more details can be found here and entries close on Friday, 14 February.